1 Then the Lord called to Moses and said to him from the meeting tent, 2 Speak to the Israelites and say to them: When any of you present a livestock offering to the Lord, you can present it from either the herd or the flock. 3 If the offering is an entirely burned offering from the herd, you must present a flawless male, bringing it to the meeting tent’s entrance for its acceptance before the Lord. 4 You must press your hand on the head of the entirely burned offering so that it will be accepted for you, to make reconciliation for you. 5 Then you will slaughter the bull before the Lord. Aaron’s sons the priests will present the blood and toss it against every side of the altar at the meeting tent’s entrance. 6 Then the entirely burned offering will be skinned and cut up into pieces. 7 The sons of Aaron the priest will light the altar and lay wood on the fire. 8 Then Aaron’s sons the priests will arrange the pieces, the head, and the fat on the wood that is on the altar fire, 9 but the animal’s insides and lower legs must be washed with water. The priest will then completely burn all of it on the altar as an entirely burned offering, a food gift of soothing smell to the Lord. 10 If the offering is an entirely burned offering from the flock—whether sheep or goat—you must present a flawless male.11 You must slaughter it on the north side of the altar before the Lord. Aaron’s sons the priests will toss its blood against every side of the altar. 12 Once it has been cut into pieces, including the head and the fat, the priest will arrange these out on the wood that is on the altar fire, 13 but its insides and lower legs must be washed with water. Then the priest will present all of it and completely burn it on the altar. It is an entirely burned offering, a food gift of soothing smell to the Lord. 14 If the offering for the Lord is an entirely burned offering from the birds, you can present your offering from the doves or pigeons. 15 The priest will bring it to the altar. He will tear off its head and completely burn it on the altar. Its blood will be drained against the side of the altar. 16 Then the priest will remove its throat along with its contents and throw it by the east side of the altar, into the place for the ashes. 17 He will then tear the bird open by its wings, without splitting it. The priest will completely burn it on the altar, on the wood that is on the altar fire. It is an entirely burned offering, a food gift of soothing smell to the Lord. 1 When anyone presents a grain offering to the Lord, the offering must be of choice flour. They must pour oil on it and put frankincense on it, 2 then bring it to Aaron’s sons, the priests. A priest will take a handful of its choice flour and oil, along with all of its frankincense, and will completely burn this token portion on the altar as a food gift of soothing smell to the Lord. 3 The rest of the grain offering belongs to Aaron and his sons as a most holy portion from the Lord’s food gifts. 4 When you present a grain offering baked in an oven, it must be of choice flour: unleavened flatbread mixed with oil or unleavened wafers spread with oil. 5 If your offering is grain prepared on a griddle, it must be of choice flour mixed with oil and it must be unleavened. 6 Crumble it into pieces and pour oil on it; it is a grain offering. 7 If your offering is grain prepared in a pan, it must be made of choice flour with oil. 8 You will bring the grain offering made in one of these ways to the Lord, presenting it to the priest, who will then bring it to the altar. 9 The priest will remove from the grain offering the token portion and completely burn it on the altar as a food gift of soothing smell to the Lord. 10 The rest of the grain offering belongs to Aaron and his sons as a most holy portion from the Lord’s food gifts. 11 No grain offering that you give to the Lord can be made with yeast. You must not completely burn any yeast or honey as a food gift for the Lord. 12 You can present those as first-choice offerings to the Lord, but they must not be entirely burned up on the altar as a soothing smell. 13 You must season all your grain offerings with salt. Do not omit the salt of your God’s covenant from your grain offering. You must offer salt with all your offerings. 14 If you present a grain offering to the Lord from the first produce, you must make such an offering from the crushed heads of newly ripe grain, roasted with fire. 15 You must put oil and frankincense on it; it is a grain offering. 16 The priest will completely burn the token portion—some of the crushed new grain and oil along with all of the frankincense—as a food gift for the Lord. 1 If the offering is a communal sacrifice of well-being, the one who offers the herd animal—whether it is male or female—must present a flawless specimen before the Lord. 2 You must press your hand on the head of the offering and slaughter it at the meeting tent’s entrance. Aaron’s sons the priests will toss the blood against every side of the altar. 3 Then you can offer a food gift to the Lord from the communal sacrifice of well-being: the fat that covers and surrounds the insides; 4 the two kidneys and the fat around them at the loins; and the lobe on the liver, which should be removed with the kidneys.5 Aaron’s sons will completely burn all of this on the altar—along with the entirely burned offering on the wood that is on the altar fire—as a food gift of soothing smell to the Lord. 6 If the offering for a communal sacrifice of well-being for the Lord is from the flock—whether it is male or female—you must present a flawless specimen. 7 If you present a sheep as the offering, you must present it before the Lord. 8 You must press your hand on the head of the offering and slaughter it before the meeting tent. Aaron’s sons will toss the blood against every side of the altar. 9 Then you may offer the fat from the communal sacrifice of well-being as a food gift for the Lord: the whole fat tail, which should be removed close to the tailbone; the fat that covers and surrounds the insides;10 the two kidneys and the fat around them at the loins; and the lobe on the liver, which should be removed with the kidneys. 11 The priest will then completely burn all of this on the altar as food—as a food gift for the Lord. 12 If the offering is a goat, you must present it before the Lord. 13 You must press your hand on its head and slaughter it before the meeting tent. Aaron’s sons will toss its blood against every side of the altar. 14 Then you may present as your offering—a food gift for the Lord—the fat that covers and surrounds the insides; 15 the two kidneys and the fat around them at the loins; and the lobe on the liver, which should be removed with the kidneys. 16 The priest will then completely burn all of this on the altar as food—as a food gift for a soothing smell. All fat belongs to the Lord. 17 This is a permanent rule for your future generations, wherever you live: you must not eat any fat or blood. 3 If it is the anointed priest who has sinned, making the people guilty of sin, he must present to the Lord a flawless bull from the herd as a purification offering for the sin he has committed. 4 He will bring the bull before the Lord at the entrance to the meeting tent and press his hand on the bull’s head. Then he will slaughter the bull before the Lord. 5 The anointed priest will take some of the bull’s blood and take it into the meeting tent. 6 The priest will dip his finger into the blood and sprinkle some of it seven times before the Lord, toward the sanctuary’s inner curtain. 7 Then the priest will put some of the blood on the horns of the altar of perfumed incense, which is in the meeting tent before the Lord. But he will pour out all the rest of the bull’s blood at the base of the altar of entirely burned offerings, which is at the meeting tent’s entrance.8 Then he will remove all the fat from the bull for the purification offering: the fat that covers and surrounds the insides;9 the two kidneys and the fat around them at the loins; and the lobe on the liver, which he will remove with the kidneys,10 just as this is removed from the ox for the communal sacrifice of well-being. Then the priest will completely burn these on the altar of entirely burned offerings. 11 But the bull’s hide and all of its flesh, along with its head, lower legs, entrails, and dung— 12 all that remains of the bull—will be taken to a clean location outside the camp, to the ash heap. It should be burned there at the ash heap on a wood fire. 13 If it is the entire Israelite community that has done something wrong unintentionally and the deed escapes the assembly’s notice—but they’ve done something that shouldn’t be done in violation of the Lord’s commands, becoming guilty of sin— 14 once the sin that they committed becomes known, the assembly must present a bull from the herd as a purification offering. They will bring it before the meeting tent. 15 The community elders will press their hands on the bull’s head before the Lord and then slaughter it before the Lord. 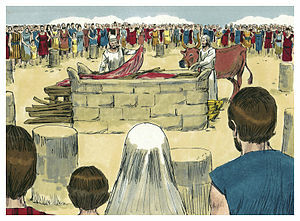 16 The anointed priest will take some of the bull’s blood into the meeting tent. 17 The priest will dip his finger into the blood and sprinkle it seven times before the Lord toward the inner curtain. 18 Then he will put some of the blood on the horns of the altar that is before the Lord in the meeting tent. But he will pour all the rest of the blood out at the base of the altar of entirely burned offerings that is at the meeting tent’s entrance. 19 Then he will remove all the fat from it and completely burn it on the altar. 20 He will do the same with this bull as he did with the other bull for the purification offering; that is exactly what he must do. In this way, the priest will make reconciliation for them, and they will be forgiven. 21 Then the priest will take the bull outside the camp and burn it, just as the first bull was burned. It is the purification offering for the assembly. 22 If a leader sins by unintentionally breaking any of the commands of the Lord his God, doing something that shouldn’t be done, and becomes guilty of sin— 23 once the sin that he committed is made known to him—he must bring as his offering a flawless male goat. 24 He will press his hand on the goat’s head. It will be slaughtered at the place where an entirely burned offering would be slaughtered before the Lord. It is a purification offering. 25 The priest will take some of the blood from the purification offering and, using his finger, will put it on the horns of the altar of entirely burned offerings. But he will pour the rest of the blood out at the base of the altar of entirely burned offerings. 26 He will completely burn all of its fat on the altar just as the fat of the communal sacrifice of well-being is burned. In this way the priest will make reconciliation for the leader to remove his sin, and he will be forgiven. 27 If any ordinary person sins unintentionally by breaking one of the Lord’s commands, doing something that shouldn’t be done, and becomes guilty of sin— 28 once the sin they committed is made known to them—they must bring as their offering a flawless female goat because of the sin that was committed. 29 They will press their hand on the head of the purification offering. It will be slaughtered at the place for the entirely burned offerings. 30 The priest will take some of its blood and, using his finger, will put it on the horns of the altar of entirely burned offerings. But he will pour all the rest of the blood out at the base of the altar. 31 He will remove all of its fat, just as the fat from a communal sacrifice of well-being is removed. Then the priest will completely burn it on the altar as a soothing smell to the Lord. In this way, the priest will make reconciliation for them, and they will be forgiven. 7 If you can’t afford an animal from the flock, you can bring to the Lord as compensation for your sin two doves or two pigeons, one as a purification offering and the other as an entirely burned offering. 8 You will bring them to the priest, who will first present the one for the purification offering. He will pinch off its head at the back of its neck without splitting it.9 Then he will sprinkle some of the blood of the purification offering on the side of the altar. The rest of the blood will be drained out at the base of the altar. It is a purification offering. 10 Then, with the second bird, the priest will perform an entirely burned offering according to the regulation. In this way, the priest will make reconciliation for you because of the sin you committed, and you will be forgiven. 11 If you cannot afford two doves or two pigeons, you can bring as the offering for your sin a tenth of an ephah of choice flour as a purification offering. You must not put any oil on it, nor any frankincense, because it is a purification offering.12 You will bring it to the priest, and the priest will take a handful from it—the token portion—and will burn it completely on the altar along with the food gifts for the Lord. It is a purification offering. 13 In this way, the priest will make reconciliation for you for whichever one of the sins you committed, and you will be forgiven. The rest of the offering will belong to the priest like the grain offering. 14 The Lord said to Moses, 15 Whenever you commit wrongdoing, unintentionally sinning against any of the Lord’s holy things, you must bring to the Lord as your compensation a flawless ram from the flock, its value calculated in silver shekels according to the sanctuary’s shekel, as a compensation offering. 16 You will make amends for the way you have sinned against the holy thing: you will add one-fifth to its value and give it to the priest. Then the priest will make reconciliation for you with the ram for the compensation offering, and you will be forgiven. 17 If you sin by breaking any of the Lord’s commands, but without realizing it, doing something that shouldn’t be done, and then become guilty and liable to punishment, 18 you must bring a flawless ram from the flock, at the standard value, as a compensation offering to the priest. The priest will make reconciliation for you for the unintentional fault that you committed, even though you didn’t realize it, and you will be forgiven. 19 It is a compensation offering. You have definitely become guilty before the Lord. The haftarah is a text selected from the Prophets that is read after the reading of the Torah. It usually has a thematic link to the Torah reading that precedes it.